When will be Come Dine Champion of Champions next episode air date? Is Come Dine Champion of Champions renewed or cancelled? Where to countdown Come Dine Champion of Champions air dates? Is Come Dine Champion of Champions worth watching? Dave Lamb presents the series which features ex-winners of the original Come Dine with Me series battling it out against one another. This brand-new episode sees managing director Richard Moore from King's Lynn take on bar manager Jelone from Ealing and support worker Andrea Grainger, from Cardiff, for a place in the final to be crowned champion of champions. Jelone has to tackle two very large onions for a stuffed onion starter - can he work his magic by adding lots of his 'soul seasoning'? Andrea tries to bring a bit of Welsh to her main course of luxurious asparagus lasagne by the addition of yellow tomato posing as a daffodil and glittery red tomatoes. Will it be enough to impress Michelin star chef Glynn Purnell? Richard is in for a surprise when his memorable guest competitive Amber Woolmington turns up to try his take on her chicken ballotine with stuffed courgettes. Will she think it's better than her original? And in the dessert challenge, a julienne lime garnish poses a problem for all three of the champions. In this brand new episode business manager Emma Revis from Hull battles it out against artist and mobile creperie owner Glenn Davison from Hull and choreographer Simon Green from Blackpool. During their three culinary challenges Glenn is offended by Emma's interpretation of his uniquely named 'Ocean Romanticism' that she is tasked with making in the starter swap. Glenn invents a new sauce, calling it a 'Glenn sauce', and Simon impresses Michelin star chef Glynn Purnell with his food knowledge but will it transfer to the plate? Glenn is in for a shock when his memorable guest Krystyna Stark pops in to try his take on her main called 'Chininda' - a fusion of curry and Chinese - and she compares it to dog poo. Who will it be going through to the final for the chance of becoming a champion of champions? In this brand new episode, magician Kevin Duffy from Shropshire battles it out with complimentary therapist Helen Speakman from Carlisle and lecturer Amber Elba -Pawsey from Bury St Edmunds. Kevin hopes his magic wand will create an illusion when it comes to serving up his cakeless fishcakes! Amber has issues when she has to tackle her memorable guest Tim Ryman's mango chicken with carrots boiled in orange squash. Amber decides to use the orange squash in a few different ways - but will the risk pay off? Helen gets into the Spanish spirit when she is tasked with making Paella - so much so she asks for castanets! The dessert challenge turns out to be a messy one, and when Kevin presents his on a cheese grater, Michelin star chef Glynn is stunned. But will it be good enough to take him through to the final for a chance to take the crown of champion? It's the final in this brand new Champion of Champions competition. The four winners from the heats get behind their cooking stations for one final time, and at the end of the day one of them walks away a champion. Chicken, tarragon and grape salad takes on chicken, asparagus and pea risotto in the starter duel, and venison with an orange and juniper sauce takes on duck with vanilla mash. There is also a big surprise in store for our finalists: joining presenter Dave Lamb and Glynn Purnell at the dining table are the eight losers from the heats, who will not only be tasting the food but also scoring it, meaning that the finalists have to make a total of 12 plates of food. Only two champions can go through to the dessert finale where they face the ultimate technical challenge set by Glynn Purnell - and it will be down to the Michelin-starred chef to decide whose dessert outshone the other and take them to glory, becoming a champion of champions. 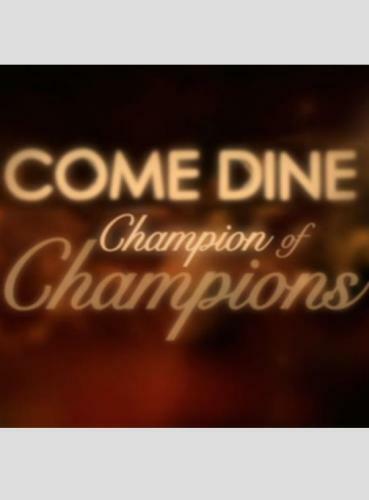 Come Dine Champion of Champions next episode air date provides TVMaze for you. EpisoDate.com is your TV show guide to Countdown Come Dine Champion of Champions Episode Air Dates and to stay in touch with Come Dine Champion of Champions next episode Air Date and your others favorite TV Shows. Add the shows you like to a "Watchlist" and let the site take it from there.